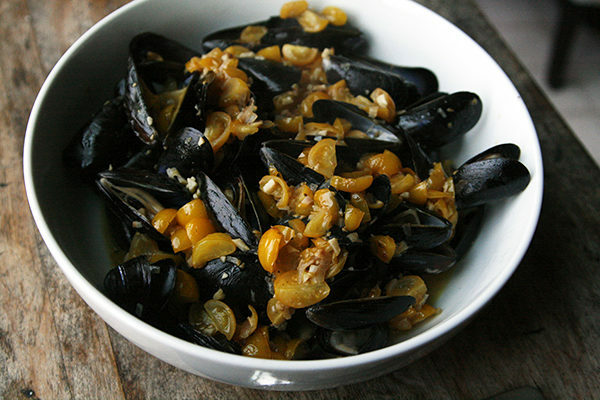 Steamed with tomatoes, shallots , garlic and some white wine, this quick and easy mussels recipe is perfect for dinner any night. The little fish store was perched on the edge of a waterfall, near a historic stone structure on a curve in the road. It didn’t escape me what an unlikely location it was. Inside, the men who worked there had kind faces and voices. I remember them being so helpful as my family contemplated what to order. That was the fishmonger of my childhood — the one with the window overlooking the falls and limited parking and the tanks of lobsters that fascinated me. It smelled of salt water and fish, as fish stores tend to do. We’d order swordfish or salmon or something the men suggested. 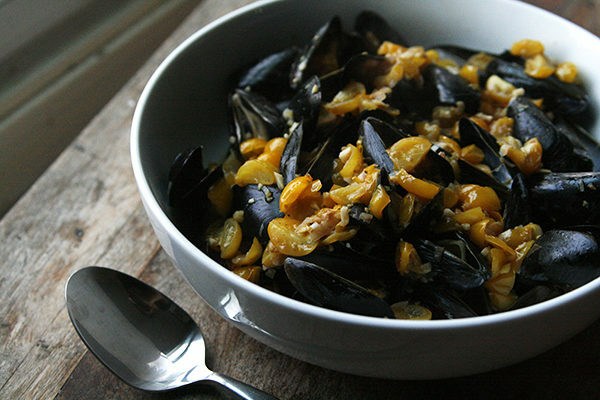 Sometimes we’d get clams too — or, in a rare treat, mussels. Though I never thought about it then — or ever before — that must be when I fell in love with mussels. It was long before bowls of seasoned mussels at restaurants called to me and long before I discovered the joy of fried mussels. It’s been years since I was a little girl amazed by the sights and smells of that store. It’s long gone now, replaced by a restaurant and nightspot. When a fish store opened nearby here in Maine last year, I was so excited. I love buying from experts, and the folks who work there are. Sometimes when I am picking something up for dinner, I want a little guidance based on what we’re feeling like and what they have. They deliver it with friendly voices and kind smiles — and remember us every time, just as the fishmonger of my childhood did. Plus they also serve a mean chowder — something the kids and I stop in for fairly regularly. On a recent visit, the mussels in the display caught my eye. Two pounds confined in a tidy mesh bag, just begging to be transformed into something delicious. I could practically taste them — steamed with tomatoes and shallots and garlic, some white wine. Mmm. This is a dish that speaks summer. 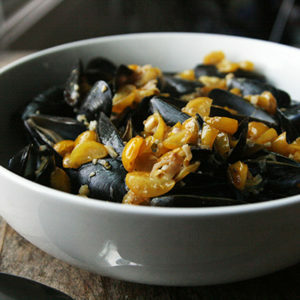 Tender, fresh mussels smothered in a fragrant sauce of tomatoes, shallots, garlic and white wine. Serve it with slices of crusty bread for dipping. And if you happen to have a little family owned fishmonger near you, stop in. It might be a little smaller than you’re used to, and their selection may be dictated by what’s available at the docks. But it’s worth it. Always. Friendly smiles and voices, good advice, helpful folks. Heat the olive oil in a large saute pan set over medium heat. 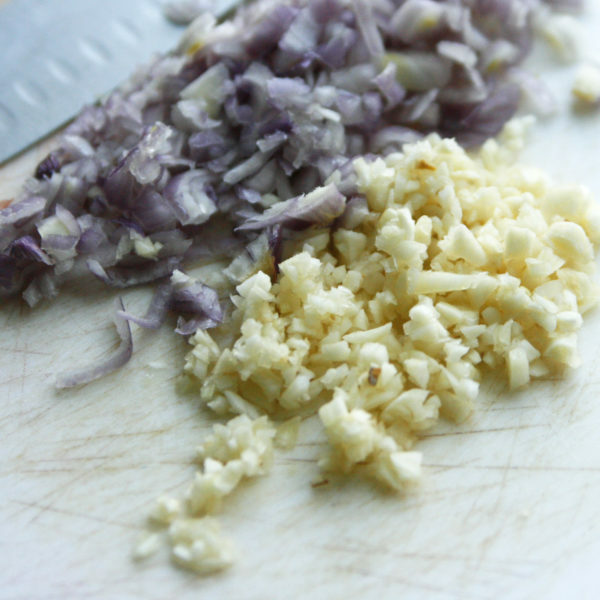 Add the garlic and shallots and cook until fragrant, 2-3 minutes. Add the tomatoes and season with salt and pepper. Cook for 5-6 minutes, or until the tomatoes soften and release their juices. Add the white wine and bring to a boil. Add the well-scrubbed mussels to the pan. Cover. 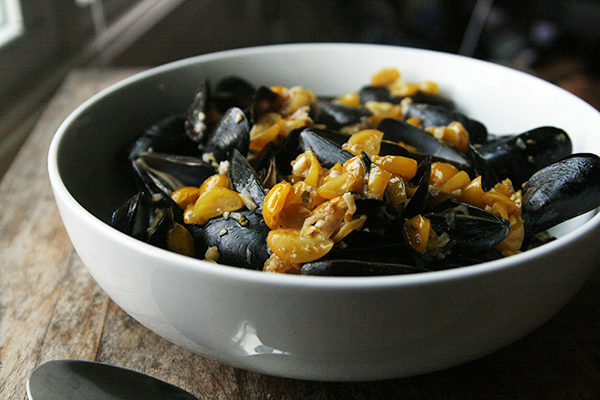 Cook for 5-7 minutes, removing the mussels to a serving bowl as they open. Discard any that don't open. Pour the garlic, shallot and tomato mixture over the mussels with all the juices. Serve. I wish I wasn’t allergic to mussels, I remember loving them dipped in butter before I developed the allergy.